For the fourth consecutive year, the Sylvans, Stephen F. Austin State University's timbersports team, won the collegiate portion of the Arkansas State Lumberjack Competition held during the 35th annual Timberfest festival in Sheridan, Arkansas. Pictured, Katie Adams and Brody Capps, both SFA forestry majors, compete in the Jack and Jill crosscut competition. Their time was the fastest for the crosscut of the competition, beating the all-male crosscut teams. 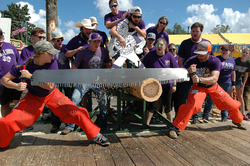 NACOGDOCHES, Texas - For the fourth consecutive year, the Sylvans, Stephen F. Austin State University's timbersports team, won the collegiate portion of the Arkansas State Lumberjack Competition held during the 35th annual Timberfest festival in Sheridan, Arkansas. "It was by far the Sylvans' most dominant victory during the past four years of Timberfest competitions," said Dr. Jeremy Stovall, associate professor of forestry and faculty advisor for the Sylvans. SFA students placed first in the Jack and Jill crosscut, single buck crosscut, double buck crosscut, women's bowsaw, men's bowsaw and underhand chop. The Sylvans narrowly missed a first-place win in the axe throw competition, losing by only one point to the University of Arkansas at Monticello. For the second year in a row, the Jack and Jill crosscut team of Katie Adams and Brody Capps, both forestry majors in SFA's Arthur Temple College of Forestry and Agriculture, executed the fastest crosscut time of the competition, besting the time of the all-male crosscut teams.